Short sellers are increasing their bets against Tesla’s stock price ahead of the company’s third-quarter earnings. Wall Street still expects a per-share loss when Tesla reports after the closing bell, but abnormally high Model 3 pricing could fuel a temporary beat, one analyst said. Andrew Left, a notorious short seller, reversed course on his earlier attacks this week, saying his firm Citron Research is now long Tesla. Tesla will report its third-quarter earnings after the closing bell Wednesday, and investors are piling into bets that the stock will sink following the report. 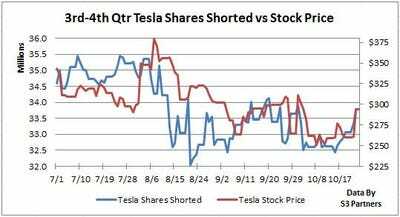 Short interest – a measure of bets riding against Tesla’s stock price – have been on a near-steady decline since the now-infamous “funding secured” tweet by CEO Elon Musk in August, but saw an uptick this week ahead of the company’s highly anticipated earnings release, according to data from S3 Partners, a financial technology and analytics firm. A solid $US9.9 billion is currently riding against Tesla, with short sellers paying more than triple in borrowing costs, 1.03%, compared to some of the other heavily shorted equities like Apple, Qualcomm, Amazon, and Netflix. While Wall Street’s consensus is that Tesla will still be in the red this quarter – analysts polled by Bloomberg expect an adjusted loss of $US0.14 per share – one analyst said the ‘abnormally high’ Model 3 price could drive a temporary profit. Langan remains sell rated on Tesla, with a $US190 price target, thanks to the $US2 billion Tesla will need by the end of 2018 to fund operations. Another $US1.8 billion of the company’s total $US9.5 billion in debt will come due in November 2019, only adding to the pressure for Tesla to become cash flow positive, as Musk has said will happen “in Q3 & Q4” this year. 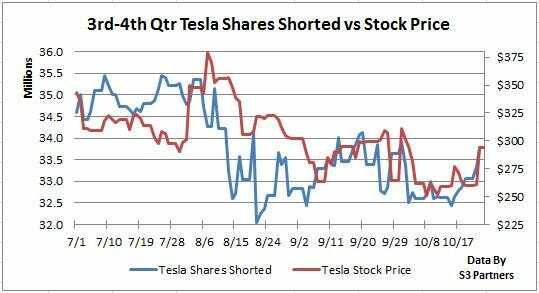 If Tesla’s report Wednesday afternoon is disappointing and the stock price declines, S3 says we could see new records of short interest against the stock “through the 35 million share level” from August.